This Urban Farmhouse features a vertical board-n-batten exterior with metal roof accents and gables highlighted by decorative brackets. The front porch is welcoming with twin columns that frame the front door. The gourmet kitchen contains an over-sized island with a prep-sink and an additional serving bar overlooks the vaulted great room. An angled pantry provides plenty of storage and a spectacular bayed-dining room is sure to impress. A utility room is conveniently located near the stairs for laundry drop-off and pick-up to the upstairs bedrooms. The spacious master suite opens to a luxurious bathroom with a freestanding bathtub and a walk-in shower. Two closets allow separation for season items, or perhaps a shoe closet. A second-floor balcony overlooks the great room and foyer below. One bedroom offers a walk-in closet and private bath while two other bedrooms have walk-in closets and share a bathroom. 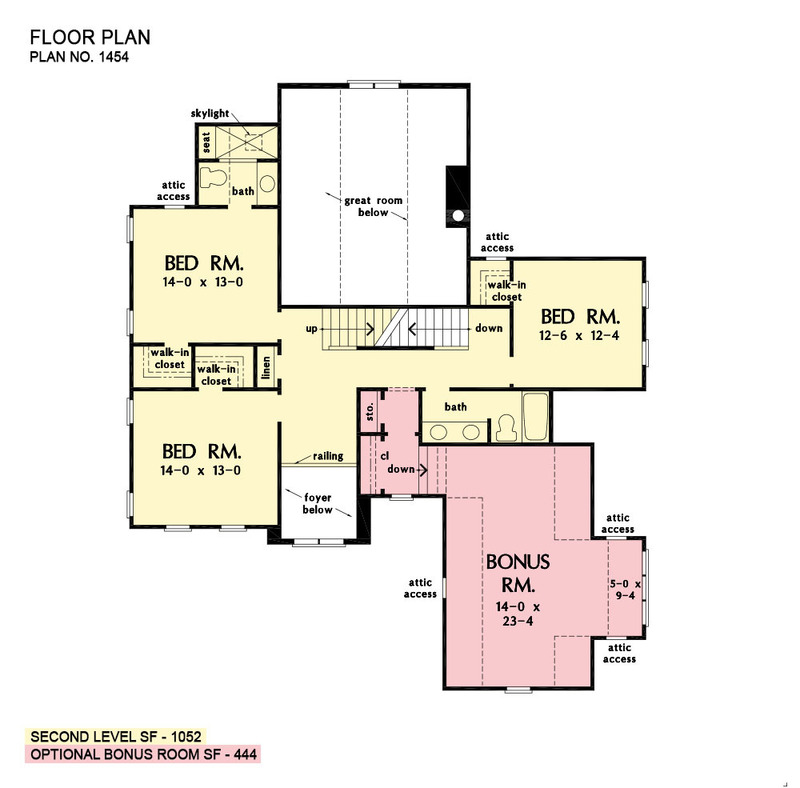 A bonus room and third floor bonus attic provide space for hobbies and entertainment. 1st Floor: 2118 Sq. Ft.
2nd Floor: 1052 Sq. Ft. Bonus Room: 444 Sq. Ft. 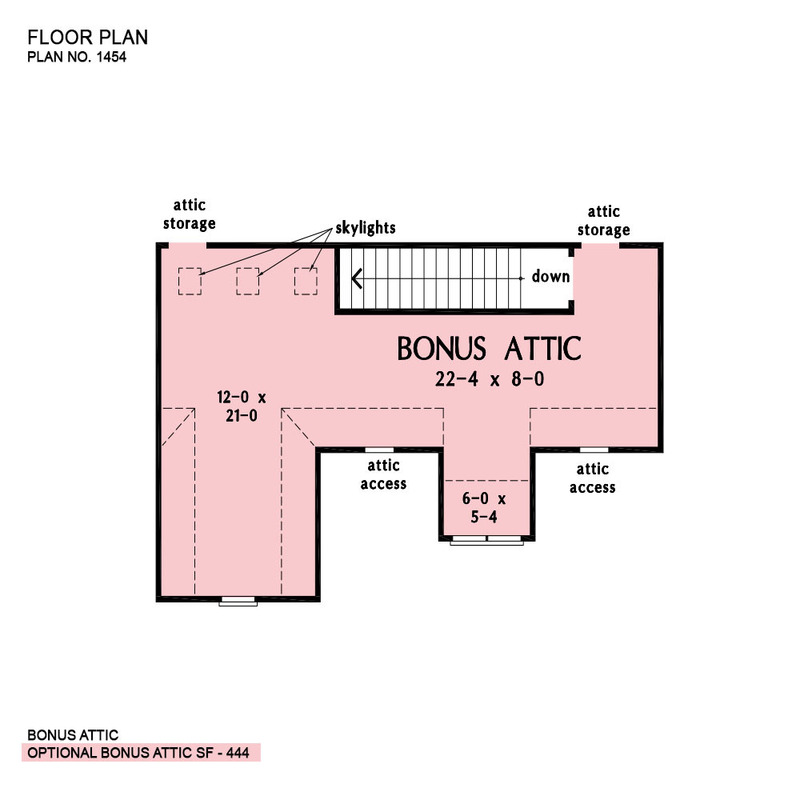 Bonus Attic: 509 Sq. Ft.
Porch - Front: 160 Sq. Ft.
Porch - Rear: 155 Sq. 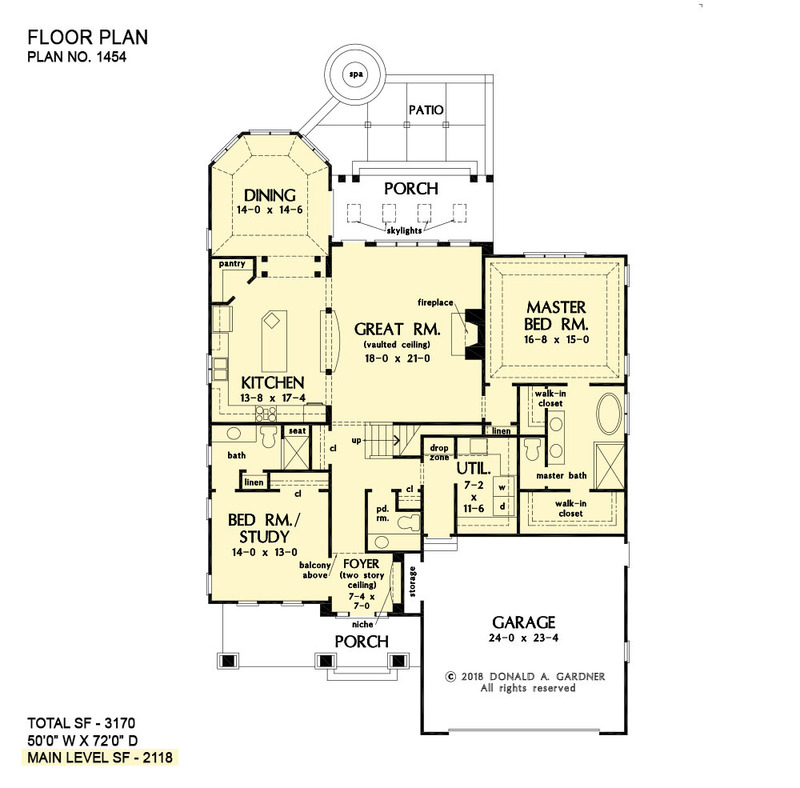 Ft.
House Dimensions: 50' 0" x 72' 0"
Great Room: 18' 0" x 21' 0"
Master Bedroom: 16' 8" x 15' 0"
Storage (2nd Fl.) (Flat): 2' 0" x 4' 0" x 9' 0"
Balcony (Flat): 7' 4" x 7' 8" x 9' 0"
Bonus Attic (Clipped): 22' 4" x 8' 0" x 8' 0"
Drop Zone (Clipped): 3' 8" x 2' 6" x 7' 2"
Bedroom #5 (Flat): 14' 0" x 13' 0" x 9' 0"
Foyer (2 Story): 7' 4" x 7' 0" x 20' 1"
Dining Room (Tray): 14' 0" x 14' 6" x 12' 7"
Great Room (Vaulted): 18' 0" x 21' 0" x 17' 6"
Kitchen (Flat): 13' 8" x 17' 4" x 10' 0"
Utility Room (Clipped): 7' 2" x 11' 6" x 10' 0"
Bonus Room (Clipped): 14' 0" x 23' 4" x 9' 0"
Garage (Flat): 24' 0" x 23' 4" x 0' 0"
Garage Storage (Flat): 2' 0" x 7' 2" x 0' 0"
Master Bedroom (Tray): 16' 8" x 15' 0" x 11' 6"
Bedroom / Study (Flat): 14' 0" x 13' 0" x 10' 0"
Bedroom #3 (Flat): 14' 0" x 13' 0" x 9' 0"
Bedroom #4 (Flat): 12' 6" x 12' 4" x 9' 0"
Porch - Front (Flat): 23' 8" x 6' 0" x 10' 0"
Porch - Rear (Flat): 19' 4" x 8' 0" x 10' 0"
Deck / Patio (None): 23' 4" x 12' 0" x 0' 0"